“I wish I had another set of hands”, is a saying that you will hear a parent say at least once on any given day. It is something that has been said or thought for hundreds of years. As our society has gotten busier, having that extra set of hands seems more and more important. Luckily, 4moms has created an extra set of hands in the form of the mamaRoo. I used my mamaRoo for our son from about a week old to about 5 months. What Does The mamaRoo Do? 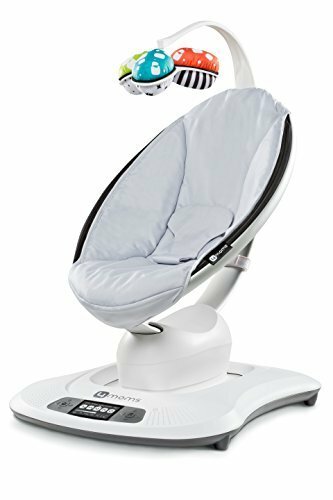 The mamaRoo is technically a baby swing, although I can tell you that this is so far beyond a swing it’s hardly fair to call it that. 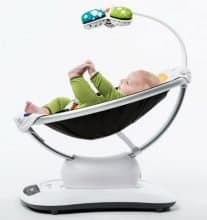 What is so unique about the mamaRoo is that it moves in 5 different motions at several different speeds. It is an all-encompassing chair that allows you to quickly sweep the floor, go to the bathroom on your own, or even have a nice cup of coffee. 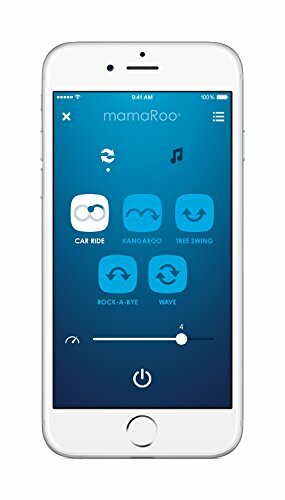 There are a lot of different bells and whistles that accompany the mamaRoo including 5 different motion choices, various speeds, audio, entertainment, and versatility. 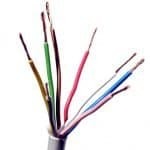 Combined, it leaves you with a lot of options so that you are sure to find the best solution for your baby. I’m sure if you haven’t bought a white noise machine you have thought of buying one. There’s a reason a lot of parents have them- they work wonders! 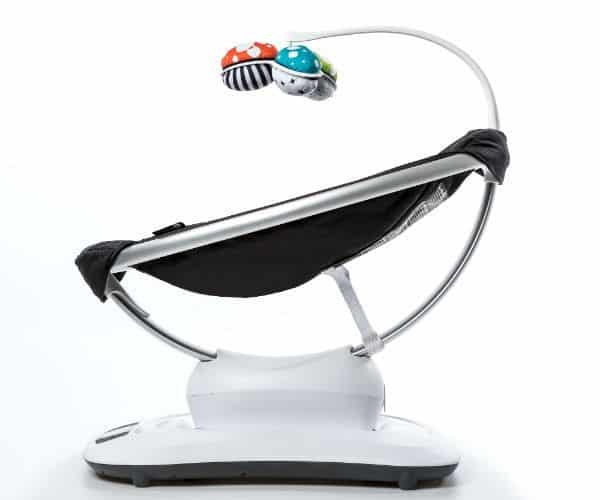 The mamaRoo offers the same quality and selection as most noise machines on the market today. Our son loved the rain audio coupled with the car ride. The noise drowned out our annoying whiny dog and let him relax enough to sometimes even drift off to sleep. Another cool feature of the mamaRoo is the Bluetooth capability. Any music I have on my smartphone, I can play on the mamaRoo via Bluetooth. I don’t know about you, but our little guy has an affinity for classic rock music. I suspect it’s because I jammed out to those tunes while I was pregnant but you never know. He was probably just born with excellent taste in music like his mama! The point is, I could hook up my Pandora to the mamaRoo and play him some quality tunes that he recognized. That helped keep him calm and happy. I mean, who doesn’t like The Rolling Stones? You can choose from the car ride (our favorite! ), a wave, kangaroo (this is the typical motion parents make when comforting their baby), tree swing, and rock a bye. We used the car ride option most of the time because that worked with our little guy. Every baby is different but I’m sure one of these options will work for you. The motion can be sped up or slowed down depending on what works best. We found that as he got older, our baby wanted it to be faster and more choppy. However, when he was an infant, he really liked the slow car ride motion, especially at night. As an added bonus, you can control the motion right from your phone using Bluetooth! Beyond just the different motions, there are excellent audio selections. The mamaRoo seat’s angle can be adjusted based on the size and age of your baby. We had it tilted back pretty far for the first month or so but then slowly kept raising the seat up to a sitting position. The only thing I regret is that we didn’t buy the infant insert. However, we got around that by placing blankets around him. I would highly suggest getting the insert though before your baby arrives. So if the 5 different motions, different speeds, and vast selection of audio capabilities weren’t enough, 4moms added some entertainment to this handy contraption. 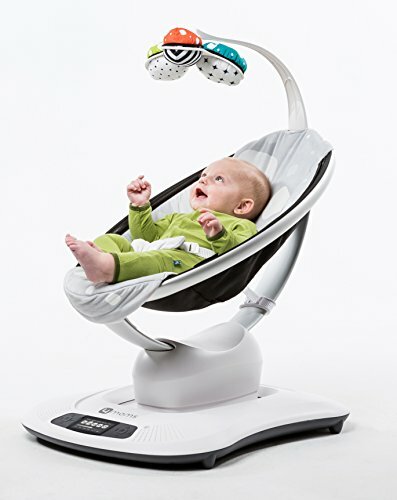 The mobile is also unique to the mamaRoo. There are three fabric balls you can place in the mobile. You can either pick the color side or the black and white side. We are pretty strict on car ride with our son, so we always chose the black and white side. The best part about the mobile is that it naturally moves when the seat moves. That way it is slowly twirling when you have an infant that can’t reach. However, it is nice and soft when your baby gets older and can bat at it without you worrying. It is fascinating enough for our little one to be occupied for a good 10-15 minutes, just long enough for a quick shower. I actually drug the mamaRoo into the bathroom and then I could make sure he was okay. Any mom will tell you taking a shower can be the difference between an exhausting terrible day and a relaxed and enjoyable day. There is a lot to love about this swing. Our son was very hard to get to sleep (and still is) when he was a baby. There was a long time there where his days and nights were mixed up and I thought I would never sleep again, ever. The mamaRoo was actually a gift and I tried it on a whim. I remember being super negative about it and thinking there was no way a swing was going to make much difference. I humbly admit I was wrong. The fact that I could put our child down for even 15 minutes to take a shower was a godsend. I really don’t think I could have gotten through his first few months of life without it! Being a stay at home mom means you are watching your child 24/7 and it’s both rewarding and exhausting at the same time. The mamaRoo enables you to take a little break when you need it. I also really liked the audio and not just for our son. It helped me relax too! I put the rain noise on at night when our little man wouldn’t sleep. He would be entertained and relax for sometimes up to an hour or two at a time and I would be able to sleep. It was soothing for both of us! Finally, the Bluetooth feature really is stellar. Being able to add some audio or movement when he needed it from bed was so nice. Those first few weeks I used the mamaRoo I wasn’t sure how other moms got by without it. You just sync up your phone with the base and away you go. 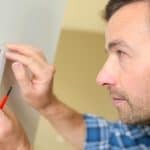 It is super easy and user-friendly. My biggest qualm with the mamaRoo is that my son grew out of it too quickly. Once he started to get close to sitting up, it was over. I remember having him in the swing in the kitchen one day and knowing I had to give the mamaRoo up. He grabbed the mobile and almost pulled himself out of the seat and onto the floor. Yes, he was buckled in. This kid is crafty though! My other negative comment is about the first few weeks using it. This is more of a “me” thing than an actual issue with the product. I should have bought the infant insert but to be honest I didn’t even know it existed because the mamaRoo was a gift. I used to get frustrated as a new mom trying to get him in the seat and then try to hold him still while putting blankets around him. Have I mentioned our kid likes to move? There you have it. There’s my list of complaints. Short and sweet but nonetheless there. Both of them aren’t really issues to be solved but I do think you should know about them going into buying the mamaRoo. If you buy the infant insert, you will probably be 100% satisfied with your purchase. Every kid grows out of their swing eventually, I just wish it had lasted a little longer! Being a new parent is tough work. There are times where you just need to put your baby down so you can take a little break. You can still be in the same room enjoying their company but able to drink a latte for a quick energy boost at the same time. The mamaRoo saved me from having a meltdown countless times. I also had a lot of fun watching my little guy smile and learn with the mobile. It was a definite win in our book. I’m not sure how any parent gets through the first 6 months without this thing. Writer, entrepreneur, wife, and mom. I am passionate about helping others live the life they want to live. My job ranges from finding the best sleeping device for my baby to delving deeper into the healthcare field to find solutions to complex issues. I have been immersed in the healthcare field since age 16 and am determined to help others live a more simple enjoyable life. Thanks for reading!